If the title doesn't make instant sense to you, this picture should help.....It was the classic underdog movie of 1984. Daniel meets Mr. Miyagi who becomes his reluctant mentor and trains Daniel-son inside and out to become things that he never could have become on his own. Lots of kids of the 80's tied bandannas around their foreheads and practiced "wax on, wax off." I'm quite sure that a huge part of the success of that movie is the longing everybody has deep inside to find someone that will help them become something greater than they are today. For Moms this ache can feel pretty desperate. Just like Mr. Miyagi did for Daniel, a mentor can lead you to places as a Mom that you couldn't get to on your own. 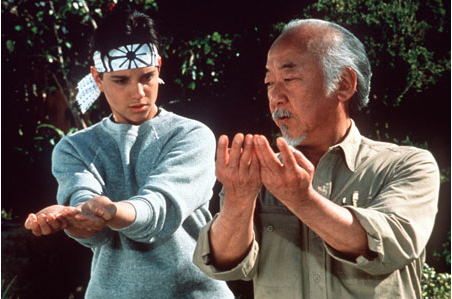 Mr. Miyagi's hands had followed the forms and built the muscles through years of repetition, learning and adjusting. The sensei's teaching had the power to accelerate the humble student's learning curve. Daniel still had to sweat and work, his transformation wasn't magical. But when he chose to trust Mr. Miyagi's methods, he was able to by-pass some of the lessons he would have needed to learn by the much slower path of trial and error on his own. Mr. Miyagi's training also had a profound effect on Daniel's confidence. He started out as a cocky, know-it-all, but as his respect grew, so did his genuine, humble trust in his own abilities. And trusting Mr. Miyagi as a source of wisdom gave Daniel a much deeper well to draw from when he got into situations that challenged him and made him feel out of his league. We all remember that heart pumping scene during the final match when Daniel's leg was hurt. We saw the uncertainty and pain on his face give way to strength and calm knowledge as he met Mr. Miyagi's eyes and read the message there. It was a victory that would have been impossible without a mentor. Imagine yourself walking down a crooked path through the woods in the dark. You can only see a small radius around you from the light the lantern in your hand spills. You walk slowly and carefully, mindful of the roots crossing your path and turns in the way that you wouldn't have time to adjust for if you moved faster. You're so thankful for your little light and you're happy to have just what you need to be able to see and consider each step as you take it. As you're walking, you see a bobbing light in the distance. You wonder if you're going so fast that you're catching up to a fellow traveler. You know that you would enjoy company and wonder if maybe your two lights would combine into a bigger circle to speed you on your way. Pretty soon you realize that you aren't the one closing the gap, it's the other light that's getting close to you. It's another Mom, who looks a lot like you except for a little more dust on her feet and a lot more wear to her pack.....she's coming the opposite way, towards you, with a smile and an outstretched hand. She links arms with you and with a little laugh, tells you about the light at the end of the tunnel. As you walk and talk, she gently directs you into hidden shortcuts and over obstacles faster than you can see them coming. You can't contain the question any longer and finally ask her how she can do that. You listen closely to her answer. "I've walked this way before and remember it. In fact, it was my feet that wore down this shortcut into a path. My memory can see things up ahead that you're light hasn't revealed yet. Just follow me and you'll be alright." Sometimes these Mentor Moms will come looking for you with an offer of their experience. Please say yes. Go to the MOPS meeting and listen to the mentor mom. Sign up for the Bible Study that the white haired ladies attend and ask questions. Make yourself available to the older women who express an interest in your life. More often, you'll have to go hunting for mentors in your life....but do it and don't be shy. Usually, the older mom hasn't offered because she feels insecure offering advice outside of an official environment....no one wants to seem like they're butting their nose in where it doesn't belong. Other times the insecurity is just because her story is still being written, and she wonders if she really has anything valuable to offer. "If you don't have one, GET ONE!" I am in the midst of just this kind of opportunity right now. I so badly want to say yes to a more experienced mom who has shown an interest in building into my life but our "mom" lives look quite different -she is a working mom to traditionally schooled kids and I am a stay at home mom homeschooling our kids, at those are just our most obvious differences, there are many really. I know so many parts of mothering are the same regardless of these kinds of things but I also know that both of us have limited time and I don't know if we are a good fit to understand each other well. Do you have advice for that? Go with it or seek out another mom who has more similar experiences? My short answer would be that if her heart seems to be one that values similar things in her parenting and if her kids are showing the qualities you are hoping to see in your own kids then you might be surprised at what a kinship can develop. Do you like her? Do you feel like you respect her parenting?? I totally understand being cautious because you've got limited time.... Maybe try to just lean into that relationship a little more without making it anything "formal" and see what develops. I've found some great friends in unlikely places...hope you do too! What a great question - thanks for asking! !